List Price $ 2, 295 Call us for our low price. 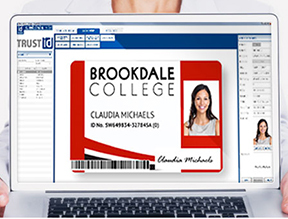 Optional Mag Stripe Encoding, Smart Card, iClass, Mifare encoding. 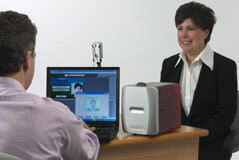 Downloads and prints a full card image in less than 23 seconds in High Speed Mode. 6 Seconds for Monochrome printing. 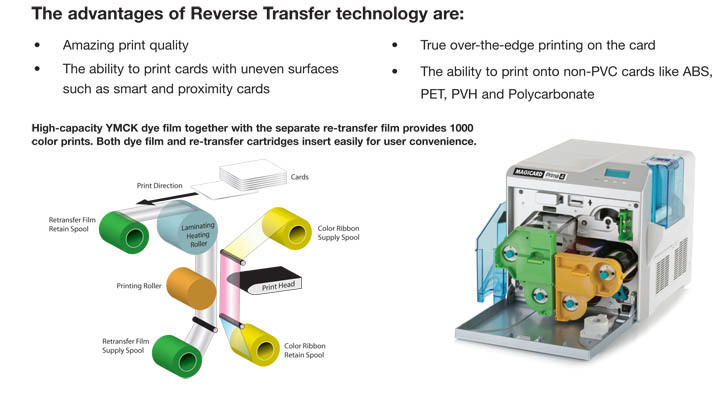 Unique HoloKote� key-controlled anti-counterfeiting card protection feature. 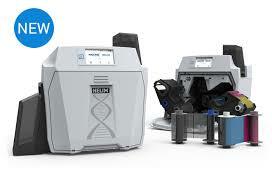 Drop-in dye film loading with automatic detection and set-up for dye film type. Whisper quiet operation thanks to advanced micro-stepping drive system. 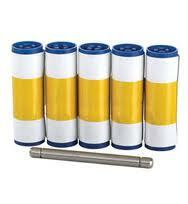 3 Year Warranty - Ultra Cover Plus - includes Print Head, and Free Loaner System !! Purchase Price $ 7,950 msrp ...call for our discount prices. 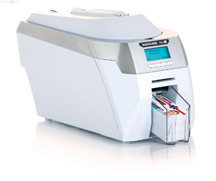 Ideal for high-quality print images and where a durable card is required. The Magicard Helix prints on the reverse of a transparent PVC re-transfer film which is then laminated onto the face of a card made from PVC, PET, ABS or PVH. Prints about 80 Cards per hour (Single Side). The quality of the finished card is similar to that achieved by the off-set litho printing process, but with the advantage that every card can be different. 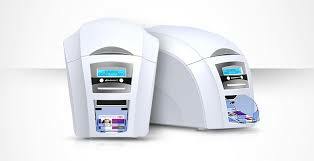 The smallest, lightest, and best value full color professional dye-sublimation ID card printer. Hand fed for easy one-off card printing. This compact, attractive design lends itself to use in company reception areas, and for hospitality applications. So small and light (only 7lb / 3.2kg) it is easily portable. YMCKO 300 Prints - MA300 - $110 ea. YMCKO 100 Prints - MA100 - $62 ea. YMCKOK - 250 Prints - MA250 - $130 ea. K (Monochrome Black) - 1000 Prints - $20 ea. Rio Pro / Enduro - $29 ea. 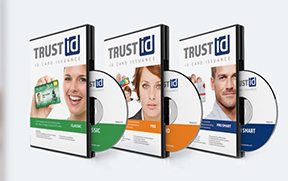 The simple and intuitive Magicard Trust ID software allows you to create and print ID Badges, Loyalty Cards, Visitor Badges, Business Cards and more. For use with the Magicard Rio Pro, Enduro 3, Helix and Pronto printers. 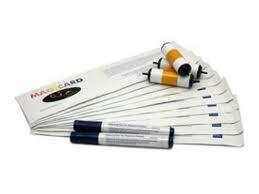 Standard version includes all card design and printing facilities. It has internal database of up to 200 entries. Professional version supports database import/export, unlimited internal database entries, and magnetic stripe card encoding. Unlimited registrations. Free Trial Version available for download.. Call for instructions and link....214-358-4277 No purchase requirement. Printing Quality Custom Cards has become very easy! Cleaning Supplies are available, GREAT PRICES - Contact Us!